It's 23:06 in Hamilton, USA right now. Lolo Hot Springs, Montana: Lolo Pass US-12, M.P. 174.2, 37.8 miles away. Gibbonsville, Idaho: Lost Trail Pass - US-93, M.P. 351, 49.2 miles away. Elk City, Idaho: SH-14, M.P. 49.5, 68 miles away. Salmon, Idaho: Lemhi County Airport, 75.3 miles away. Kamiah, Idaho: US-12, M.P. 64.7, 89.3 miles away. Grangeville, Idaho: Whitebird Hill - US-95, M.P. 231.5, 96.6 miles away. 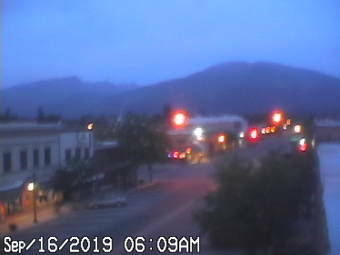 Jefferson City, Montana: Weathercam, 102.2 miles away. Cottonwood, Idaho: Frei Hill US-95, M.P. 259.2, 105.8 miles away.